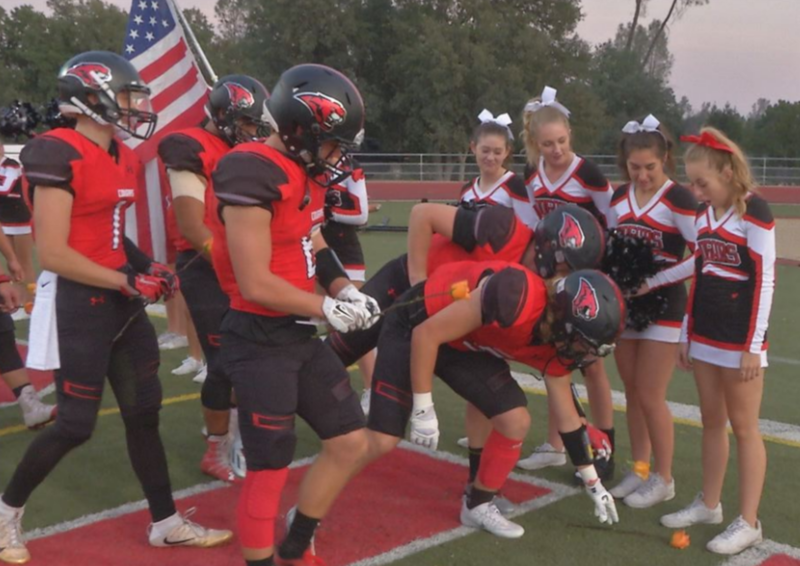 A high school cheerleader who was recently diagnosed with cancer was surprised with her own personal cheering section at last week’s football game. Fans cheered, members of the band banged on drums and Adamietz covered her mouth with her hands in disbelief. The team ends every practice with the word “family,” Brown noted. So, when players heard about Adamietz’s diagnosis in late August, they decided to do something. As a father, Brown said he couldn’t help but tear up as he watched his players deliver flowers to the girl. The football team will continue to support Adamietz’s fight against cancer by wearing orange ribbons on the back of their helmets. Fans and students are also being encouraged to wear orange to the games. As a video of the gesture continues to circulate on social media, Brown hopes the rest of the world will see that you can learn valuable life lessons through sports. “Our players are learning how a simple act of kindness can really impact millions,” he said.